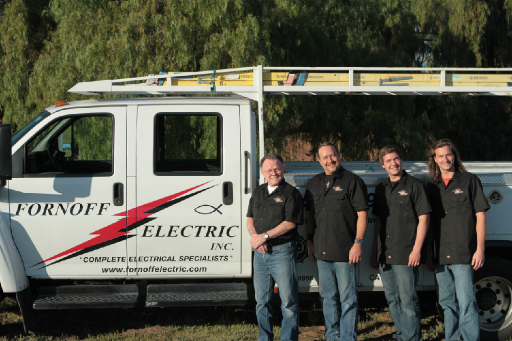 Fornoff Electric was founded in 1968 by Bob Fornoff, serving the Conejo and San Fernando valleys with expert electrical installations and repairs. In 1993, his son Mark took over the business and became president of the company. From age 10, Mark accompanied his father on jobs and, over a period of more than 40 years, Mark has learned firsthand all aspects of the business from system design to installation to marketing. Today, Mark heads a team of electricians, including his two sons Jacob and Luke, who serve commercial and residential customers. Fornoff Electric, Inc. is a full service electrical contractor and skilled at all types of lighting design and specialty areas, including custom installations, tenant improvements, electrical upgrades, inspections, and service work. Commercial clients include Home Depot, Jiffy Lube, Cylex Corporation, Visible Graphics Inc., and Multi-Chem.